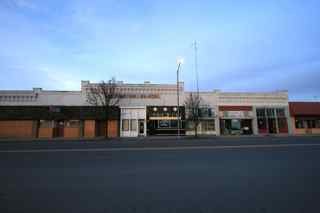 This thriving business town, of about 350 population, is located on the Northern railroad, 20 miles from Colusa and 6 miles from the Yolo County Line. It’s chief support is derived from the ranches of productive lands which lie around it. It was laid out and surveyed in 1875 and it was named after Tacitus Ryland Arbuckle, on whose ranch, then consisting of 1,900 acres, the town was built. He encouraged the creation of a new town here by giving lots to those who would build on them. The first building was built by William Dalbrow and John C. Ward, a Confederate Civil War Veteran. He opened a harness shop and also engaged as a carpenter and a contractor, building many buildings in the growing town of Arbuckle as well as the surrounding county. He served as Constable in Arbuckle for many years. The first railroad train entered Arbuckle on July 4, 1876 just two months after the train depot was completed. The Arbuckle Train Depot is now the only Train Depot remaining in the county. A new school district was formed in 1877, and a schoolhouse was erected, with Miss Annie Linton the first teacher. When the first post office was established in 1876, Tacitus Arbuckle became the first postmaster of the place, from September 11, 1876 until May 7, 1884. His son Cyrus was Postmaster from December 1885 until February 5, 1886. It has two church edifices, the Presbyterian and the Methodist and a fine large school building. On the night of December 19, 1878, the livery stable was destroyed by fire and Tacitus had no insurance. He never recovered his losses, so he moved from Arbuckle to Douglas City, Trinity County, where he died on July 4, 1889 and was buried on his ranch in Scotts Valley in Siskiyou County. The town of Arbuckle has a lot of good business’s and well kept residences.